Nokia XpresShot XS5 comes with a 64 GB SSD, up to 2 GB of application memory, Bluetooth 3.0 with 24 Mbps transfer and a brand new interface. The OS on board is also totally new and it’s called Zilo, being a new project of the folks behind Symbian. This Nokia concept phone design comes with an 18.1 megapixel camera with Full HD video recording and other features include a 4 inch OLED display with 720p resolution and widescreen format. The handset uses a CMOS sensor, Carl Zeiss Tessar lens, a Xenon and LED flash and 6x digital zoom. plus a full screen viewfinder. 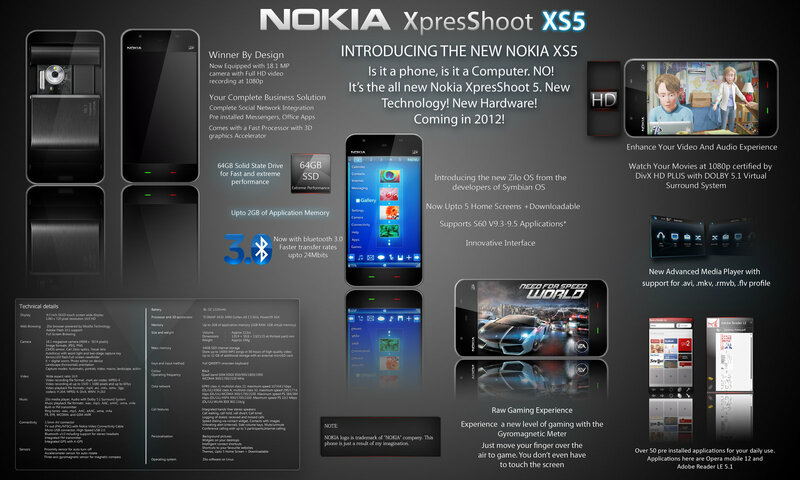 Nokia XpresShot XS5, as imagined by the Deviantart designer relies on a TI OMAP 3430 ARM Cortex A8 1.5 GHz processor, supports quad band connectivity and has a gyromagnetic meter for a new level of gaming, that allows you to move the finger through the air to control the game. Would this work nowadays?